In stock -This product will ship today if ordered within the next 10 hours and 2 minutes. Raspberry leaf contains high amounts of tannins so the resulting astringent action make it a beneficial herb in the treatment of heavy or irregular periods as well as diarrhoea and irritable bowel conditions. Raspberry leaf has a long tradition of use during the last trimester of pregnancy to strengthen and tone the uterine and pelvic muscles, and then during labour to assist contractions and to check haemorrhage. It is believed that the alkaloid fragarine is responsible for this action. 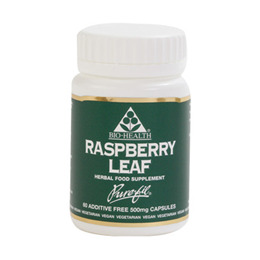 High doses should be avoided during the early stages of pregnancy as raspberry leaf can stimulate uterine contractions. Rich in nutrients, it can also enrich and encourage the flow of breast milk. The calcium and magnesium content of raspberry leaves may also help alleviate muscle spasms and PMS cramps. A cooling herb, raspberry leaf tea can help to reduce fever, and an infusion of the herb may be used as a gargle for tonsillitis or as an eyewash in conjunctivitis. Raspberry leaf extract. Capsule shell: Hypromellose. 1 capsule swallowed with water twice daily. If pregnant take only on advice from your doctor and not before 28 weeks of pregnancy. Below are reviews of Raspberry Leaf - 60 Capsules by bodykind customers. If you have tried this product we'd love to hear what you think so please leave a review.